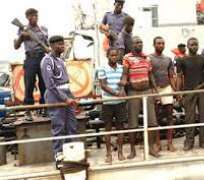 Abuja - The Central Command of the Nigerian Navy in Yenagoa, Bayelsa State has handed over seven suspected oil thieves and two vessels to the Economic and Financial Crimes Commission (EFCC) for further investigation and prosecution. The suspects were recently arrested aboard MT CERGEN D and MT RHEINFELDEN. According to a statement from the Commission, Commodore Bamidupe Babagbale, who represented the Navy, handed over the suspects and vessels at the brief ceremony. EFCC Senior Detective Superintendent, Olayinka Macaulay, received the suspects and the vessels. Babagbale also revealed that the team discovered that the first vessel, whose name was altered from MT MARIA BROSSUM to MT CERGEN D, was arrested at Fish Town loaded with 2, 356 million litres of cargo suspected to be stolen crude oil. He named the six crew members as Dauda Usman, Adelaja David, Alowakenu Mathew, Edelman Bayo, Ogja Aghedo, Adedara Tope. He said at the time of arrest, the crew members allegedly had no approval to lift crude oil. He added that the second vessel, MT RHEINFELDEN, was arrested around Akassa carrying 849,612 tons of illegally refined automotive gas oil. Aboard the vessel was one Salami Kazeem (chief officer).